Jesse Willenbring was born in 1980, in Saint Paul, USA. Willenbring undertook a formal art education at Hunter College, New York and graduated with an BFA and MFA in 2006 and 2010 respectively. His painting style is heavily influenced by Simultanism, a method pioneered by Sonia and Robert Delaunay, and this is reflected in his sophisticated colour sensibility with emphatic pastel tones. Willenbring’s artwork continues to develop upon modernism’s painterly lineage and ultimately emerges as a considered approach to both colour theory and graphic content. 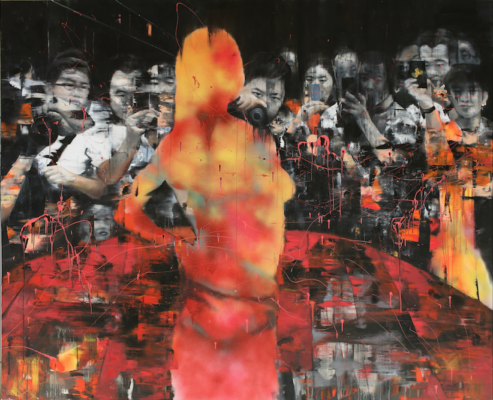 His use of mediums culminates in an additive process of layering not only acrylic paint but a multitude of materials such as graphite, charcoal and pastel. It is through this sharp and articulate combination of media that Willenbring is able to achieve a graphic sensibility with both geometric and dynamic undulating lines. Willenbring’s work is heavily influenced by philosophy, history and ancient mythology, which he uses as a starting point for his canvases. The works then evolve to find current socio-political parallels which make the work relevant in today’s world. He does so through his technique which combines cubism and heavily contemporary imagery derived from advertising and daily modern life. Indeed, the complexity of the myths are solved by the materials he uses and the symbols he chooses. Willenbring has exhibited in both solo and group exhibitions globally since his emergence onto the art scene.